"Always two, there are. No more, no less. Master ... and apprentice," as a wise Jedi master once said. With this cross stitch tutorial, you will learn how to stitch up a sampler with a classic sci-fi theme. Don't be scared. Fear leads to anger, anger leads to hate, hate leads to suffering. In a few easy steps, you'll go from cross stitch Padawan to Jedi Knight. 1 skein white embroidery thread (Anchor shade 001). 14 ct black aida 25cm x 25cm. 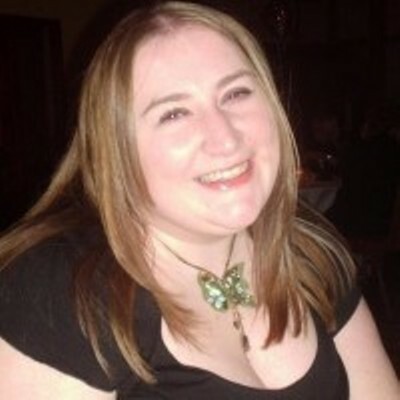 Firstly, I'm going to just put this out there - we're going to the Dark Side. Black aida can be tricky to work with, but a light-coloured thread, like the white we're using here, really makes your stitches pop. Think of this project like making the Death Star Trench Run - trust the force and I'll guide you to your place in the Jedi Archives. To prepare your fabric for stitching, locate the centre. Take your fabric, fold it in half and then in half again. Lightly crease it and then unfold. You’ll see the faint lines which intersect in the centre of the fabric. If you’re using an embroidery hoop, place the fabric in the hoop with the centre of the fabric in the centre of the hoop (I used a 5″ embroidery hoop for this project). You can either start stitching in the centre or count squares from the centre to an outer edge and start there. To find the centre of your chart, simply count the number of stitches in the widest row and divide by two. Repeat for the widest column and then cross-match the two to find the centre stitch and hey presto - Owen's your uncle! Once you’ve decided where to start stitching, take your embroidery thread, unwrap the skein and cut a length approximately 30cm long. Separate out two threads and thread your needle. Bring your lightsaber, uh, I mean, needle up from the underside of the fabric in the bottom left-hand hole of the square you want to stitch in. Draw the thread through slowly, taking care to keep the thread running smoothly, so it does not knot or get snarled up. If you pull too hard, the thread will come all the way through, you'll get frozen in carbonite, and you’ll have to start again. Once the thread has been drawn through, leaving a tail of approximately 3cm, insert the needle into the top right-hand corner of the same square from the top side of the fabric and pull the thread through. Now repeat this to form the second leg of the cross – from the underside, insert the needle of the top left hand corner of the same square and pull the thread through, with the cross being completed by entering the bottom right hand corner from the top side. Now you have one complete cross stitch - I bet you feel as proud as Darth Vader did of Luke Skywalker. You know. After he tried to kill him and stuff. Now you need to secure the end of your thread so it doesn’t unravel. As you carry on with your stitches, flatten the tail of your thread along the underside of your fabric and stitch over it as you go, catching the thread under your stitches. This will keep the thread from unraveling without making your work bumpy or bulky. I recommend stitching each letter at a time for this pattern, rather than stitching in rows. Take care to make sure your needle is going through the dead centre of the holes - it can be difficult to see that on black aida, so to make it easier, make sure you are stitching in good light. A top tip for stitching on dark-coloured fabric - hold your work over a piece of white paper, or even wear light-coloured clothing whilst you stitch - it makes the holes much easier to see. Try it! Stitching on black aida can be more annoying than Jar-Jar Binks, so make it easy on yourself. When you've completed your first letter and you're ready to move on to the next, or when you have run out of thread, you need to finish your stitching off. On the underside of the fabric, weave your needle in and out of the back of your stitches a few times and draw the thread through, taking care not to go through to the front side. This will secure the end of your thread and stop any stitches coming undone. It's a good idea to finish off each letter, as white thread can show through the black fabric pretty easily, a bit like when you accidentally wear your black undies below your fancy white ceremonial Jedi robes. Take care to keep your threads neat and tidy – try to keep your stitches all going in the same direction and make sure you check your chart carefully at regular intervals to ensure you don’t go wrong. You may find it useful to cross off the stitches you’ve done with a pen as you go. Remove the fabric from the hoop if you’re using one and flatten it out. Take a warm (but not hot) iron and place a clean tea towel over the stitches. Spritz a fine mist of water over the towel, and lightly press the fabric, taking care to iron out the creases you added at the start. Don't iron directly onto the aida, as the heat can discolour the fabric slightly. Now to frame your sampler, so you can hang it up in your X-Wing and be the envy of all your Padawan mates. If you're feeling fancy, you can use mounting board and block your work, but come to the Light Side and take the easy route. Simply take the frame you want to use and remove the glass or perspex. Use this as a guide by laying it over your stitching, ensuring the design is in the centre of the frame. Cut around the glass and the fabric will fit perfectly in the frame – easy! 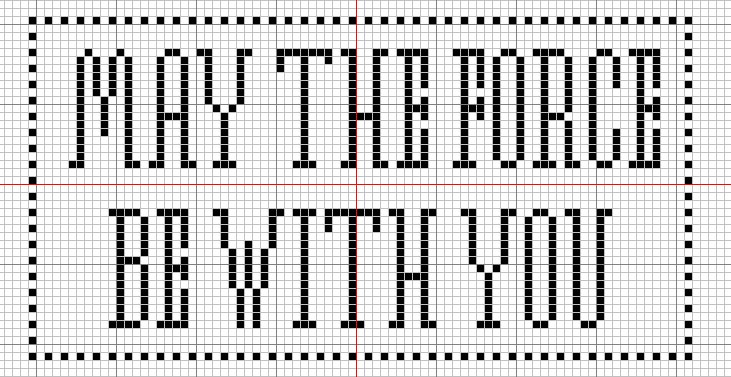 In this tutorial you learnt how to cross-stitch a "May the Force Be With You" sampler, fit to brighten up any wretched hive of scum and villainy, and become a cross stitch Jedi. 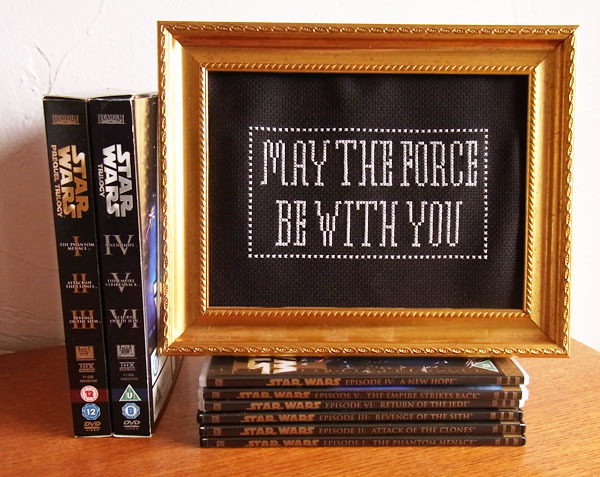 Tell us your thoughts on our Star Wars cross-stitch tutorial. Have you got another quote from the series you'd like to stitch up? We’d love to hear from you. Oh, and Happy May the Fourth!